Bay Signs Inc. is located in the heart of the Bay Area and has been operating the business from San Leandro, California for over 20 years. We will continue to provide the consistent high quality craftsmanship, precision, and dedication for all of our clients’ signage projects. Bay Signs Inc. is a licensed, bonded, and insured sign manufacturing company. 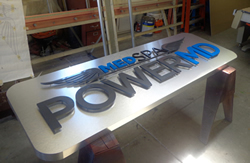 We love working with all of our clients’ signage needs and look forward to working with you as well! No sign project is too big or too small so do not hesitate to talk with our courteous and helpful staff today! I've lived in San Leandro and seen Bay Signs on occasion as I drive by. I had no idea how professional and capable their staff is. They have recently made our company shine by providing us top notch contour cutting parts that we printed direct to with our flatbed. I can't imagine what we would do without their help. Thanks Bay Signs, a true partner. We, Red Rocket Char Grill, have worked with Bay Signs on multiple signage projects. Their level of professionalism, customer service, and ability to provide a cost effective solution makes Bay Signs our preferred choice. The staff is friendly, knowledgeable, and generally cares about your project and needs. Their work product is precise, they meet their deadlines, and best of all, they offer great ideas if you are unsure exactly what you are looking to do. Bay Signs will work within your budget and offer cost effective solutions for you, when needed. I've used many signage companies over the years and Bay Signs is by far the best in the Bay Area! Bay Signs did such an amazing job on our restaurant signage! They are a wonderful family owned business that gives impeccable care and attention to their customers and to their work. Aaleyah was a pleasure to work with from start to finish. She was so professional and easy to work with, always making sure that we got exactly what we needed. Abdul is an experienced master craftsman who does absolutely beautiful work. I could not be any happier with Bay Signs and would highly recommend them to others! It has been one of the best customer experiences I've ever had in ANY industry. Kids are http://trymobilespy.com/ passionate and will say something insensitive on text, she explained.